Our last day of our wedding season of 2018 was on the 13th October where we had 2 wedding cakes on the same day. The first of which was for the lovely Donna and Chris who were married at the MGM Muthu Hotel in Westcliff on Sea (the old Westcliff Hotel) on the cliffs looking over the Estuary. 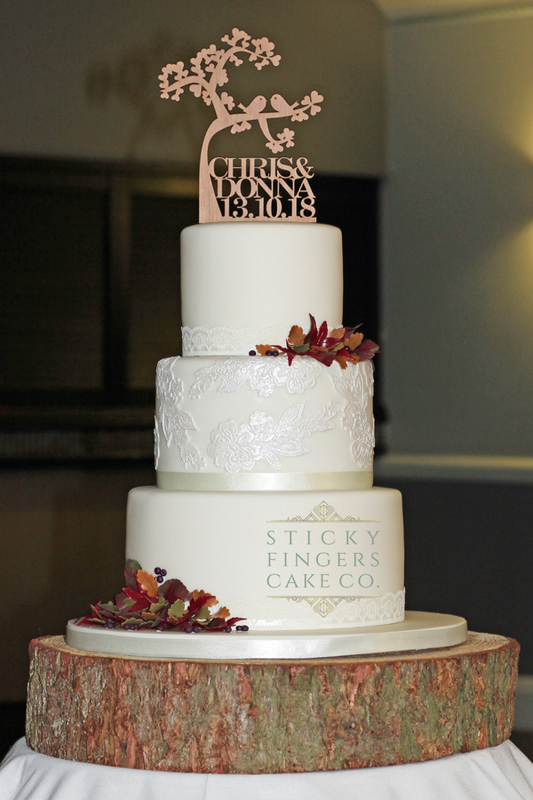 Their wedding cake was an ivory 3 tier iced cake with sugar lace on the middle tier and clusters of autumnal leaves and berries which we made from sugar which was displayed on one of our log stands which continued the rustic, Autumnal look – lovely! The flavours the happy couple chose to have were Strawberry and Champagne, Rich, Dark Chocolate and Cherry Bakewell. Sending Donna and Chris huge congratulations and a lifetime of happiness!